Ananka's Diary: Merry Christmas and Happy Hanukkah! Being friends with you IS lucky!!! Now we go crazy by singing songs like Utsuu Tetsujin Kyodain!!! My cousin (age 1) was scared of the Christmas tree. He wouldn't touch it, and he would move away from the tree. those poor girls, so embarrassing!!! you were such a cute little baby! JK. Happy Holidays! Awwwwwww you were SO CUTE!!!!! Happy Holidays,Kirsten! Those mall Santas.... *shivers*. Did you know that there is a book out, one of the little square ones full of photos, that only has pitures of little kids on Santa's lap, crying? It's so mean and yet so hilarious! I've never actually had my picture taken with santa but I only realized it when I read this post! Weird, no? P.S. Kirsten, I thought if anyone knew it would be you so do you know what a Luska is? I think its some kind of monster, but it was in a book I read (Monster Hunter International by Larry Correia, My absolute favorite book, right after Kiki Strike of course) so the authoer may have made it up but its bugging me. 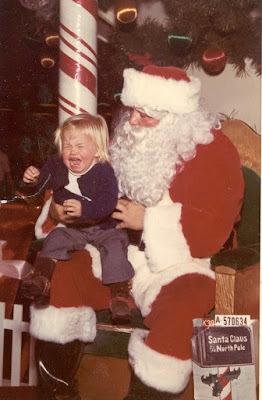 I never particularly liked sitting on Santa's lap. Then again, I'm not particularly fond of being close to people I don't know. My sister's photo with Santa was in the local newspaper when she was about seven. Boy, you were dangerous as a baby! Who trained you? 1. He was not Santa. 3. And what the heck were they doing taking a picture of me? I don't celebrate Christmas, but I always wave to Santa at shopping centres! I wouldn't mind getting a photo actually. I wanted one, but obviously I'm not young enough.. How unfair! Aparently at some Mall Santa convention there was a big fight between all of the santas..... and I think the santa in 'A Christmas Story' Is really creepy!!! IDHSCB: Are you Japanese??? I like going crazy! And I love Japan!